Our introduction to Malaysia wasn’t the best. Malaysian Airlines is a bit worn down, the airport taxi charged us more, even though I prepaid at the airport, and there was no soap in the bathrooms of our AirBNB apartment. Sunrise view from the Venice Hill apartment in Selangor. The fridge wasn’t set up completely, so Hannah slipped in a puddle of water on the way to the bathroom in the middle of the night. The next morning, the girls accidentally broke one of the glass cupboard doors. We wanted to take a breather in the pool, but then it started to rain and Hannah slipped on a step on the way back. 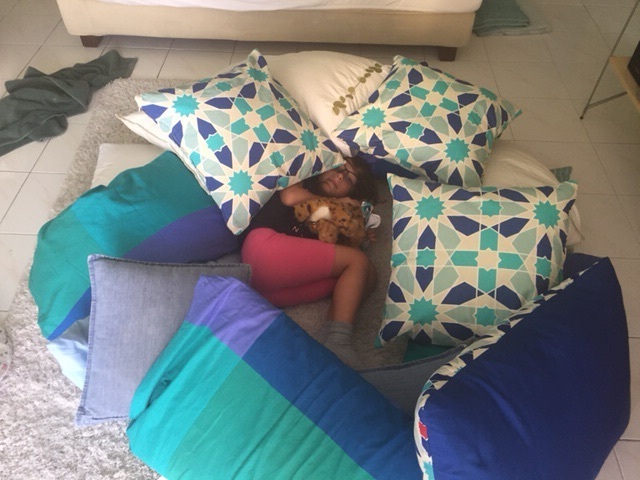 The girls had a lot of fun with all the pillows in the apartment. Luckily things only got better from there! 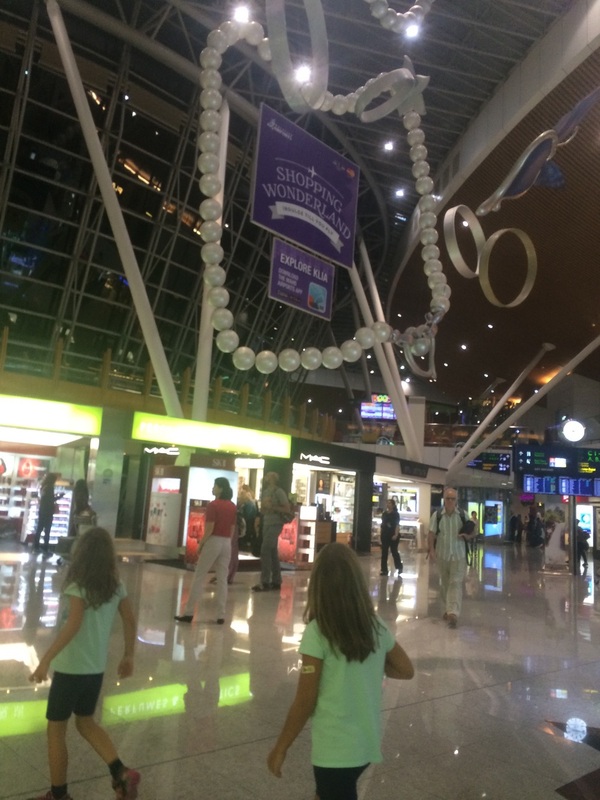 We got out to the Suria KLCC shopping center and had our first taste of Malaysian food. Malaysian shopping centers are something else! They are usually 5 floors or more. Some have ice rinks, others have amusement rides (Times Square, which we didn’t go to), and others just tons of stores, food courts and restaurants. 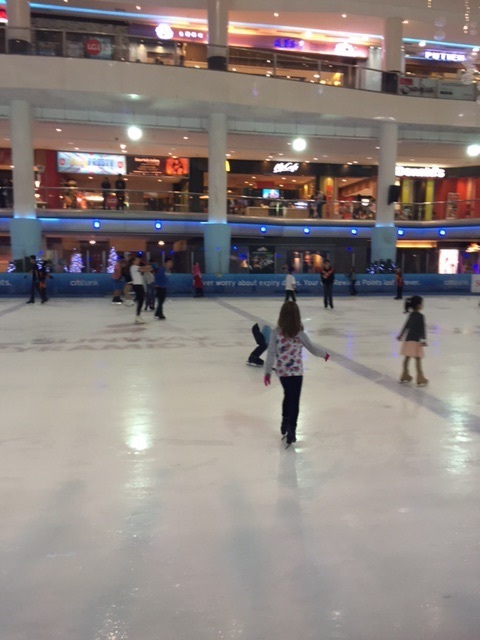 Yes, Amy got to go ice skating…after a full day at Sunway Lagoon. We were trying to avoid KL traffic, but it ended up being 9pm before she got on the rink! I’m told that the demand for shopping centers is driven by foreigners, as it’s cheap to shop in Malaysia. For us, the draw was the food and the relief from the humidity. We also liked being there in December, so we could see the malls all decked out for Christmas. The rampant consumerism got to me after a while though, as I kept thinking about all the resources needed to make all this stuff that we really don’t need. 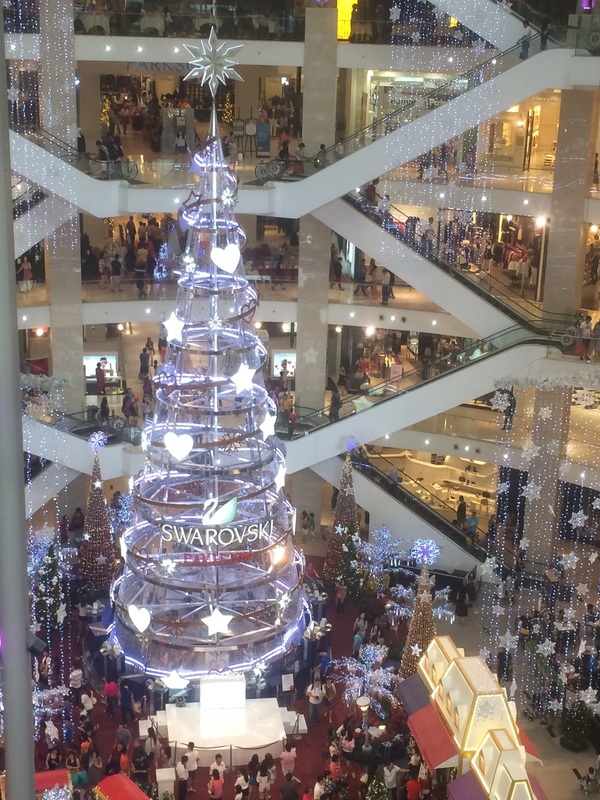 Largest Swarvosky Christmas tree in Asia! 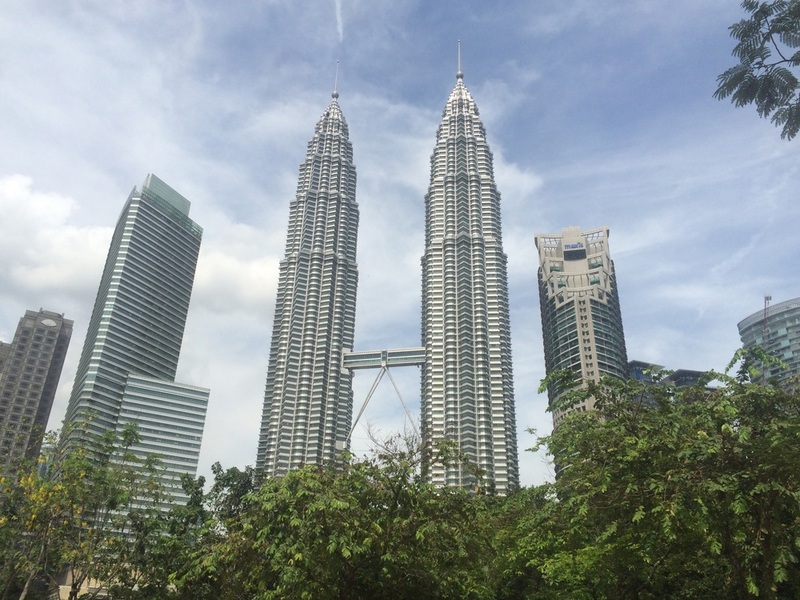 Some other big attractions in Kuala Lumpur include the Petronas Twin Towers and the Sunway Lagoon. The twin towers were the tallest in the world until the one in Dubai went up. The towers have a sky bridge connecting them on the 41st and 42nd floors…no glass floor though! Petronas twin towers with sky bridge. We went up to to 88th floor. Locals told us after that the KL Sky Tower is better. Sunway Lagoon is an amusement park, water park and animal park rolled into one, though not nearly as extensive as Canada’s Wonderland or Six Flags. 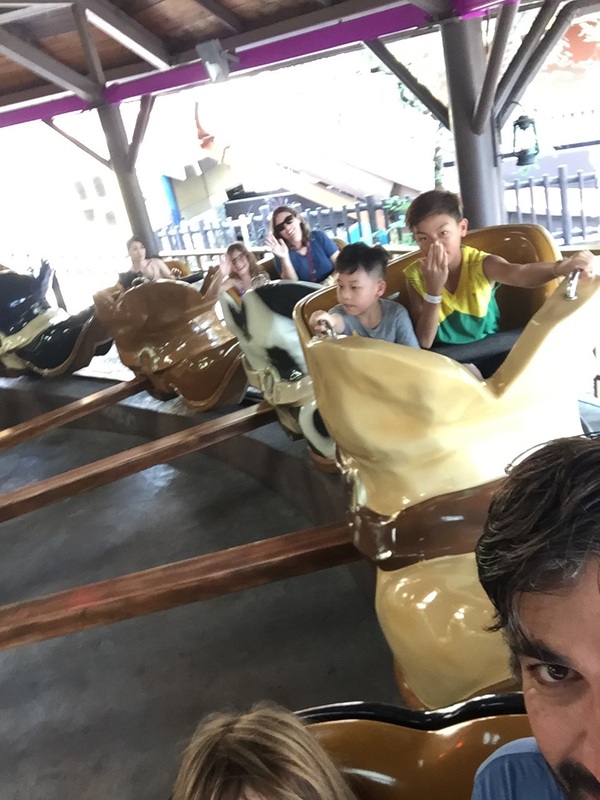 We started at the Amusement Park, then Hannah (thankfully) insisted we visit the Animal part. We got there at feeding time, so saw a lot of animals close up, including the Sun bear which we missed at the Taronga Zoo. We finished the day up at the water park, with the girls partying it up in the wave pool which was playing loud dance music. Sunway Lagoon had a very Western theme. We rode in a cowboy boot around a cowboy hat! 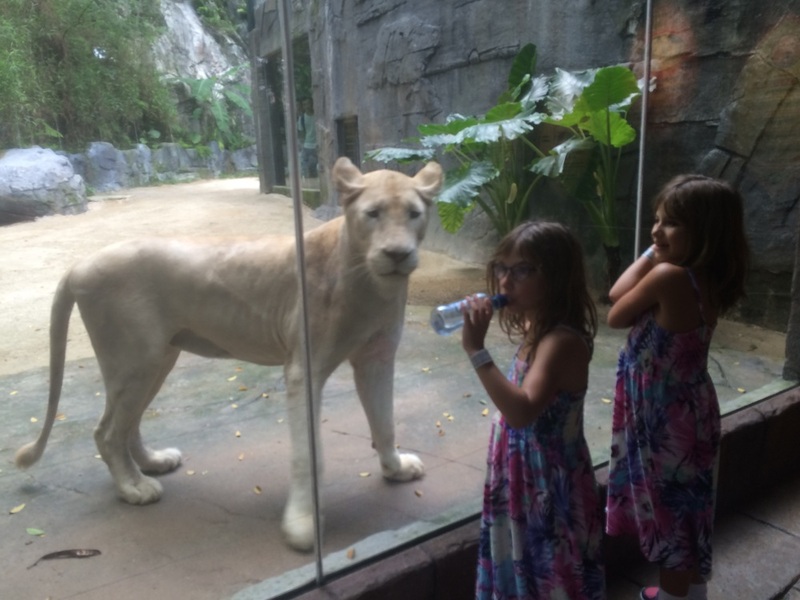 White lion to Amy: Are you going to share some of that water with me? It’s humid for us too! 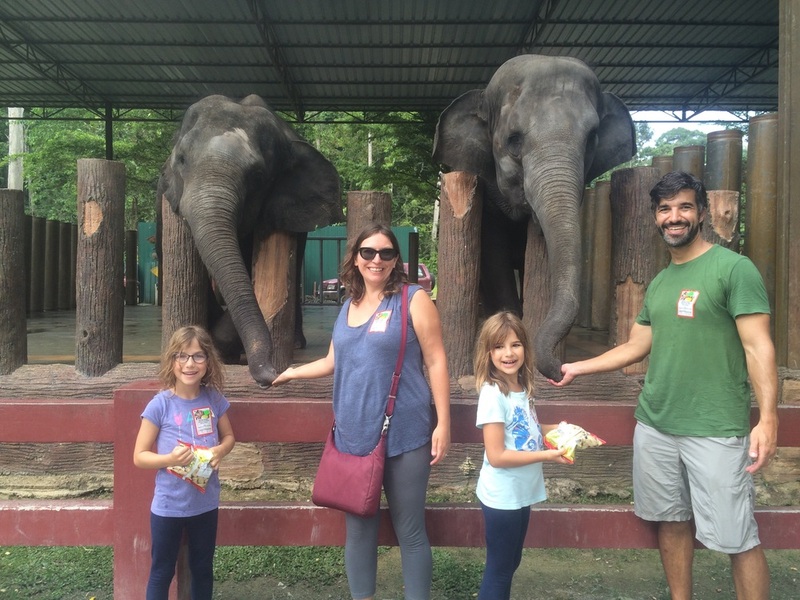 To take a break from the city, we went to the Kuala Gandah Elephant Orphanage Sanctuary about 2 hours from the city. 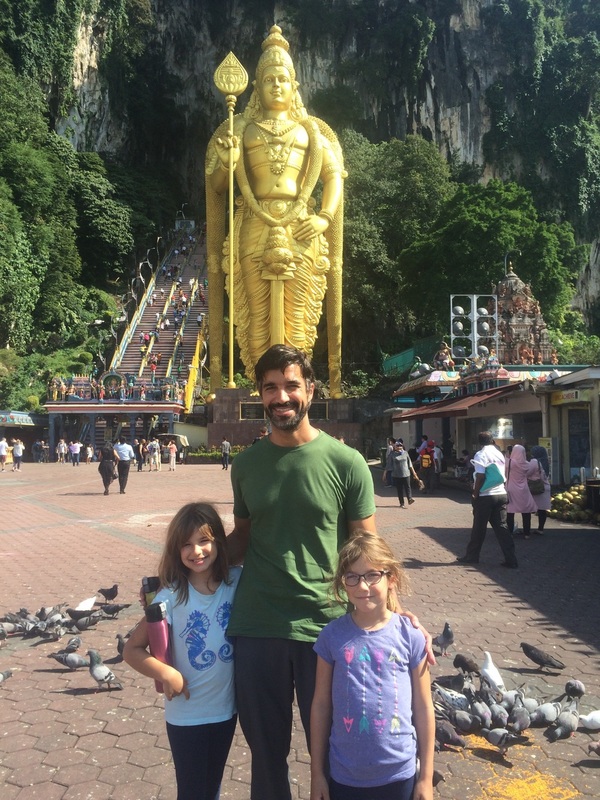 We stopped at the Batu Caves, the largest Hindu shrine outside of India, on the way there. The Batu Caves is the most popular Hindu shrine outside of India. It’s almost 300 steps to the top! 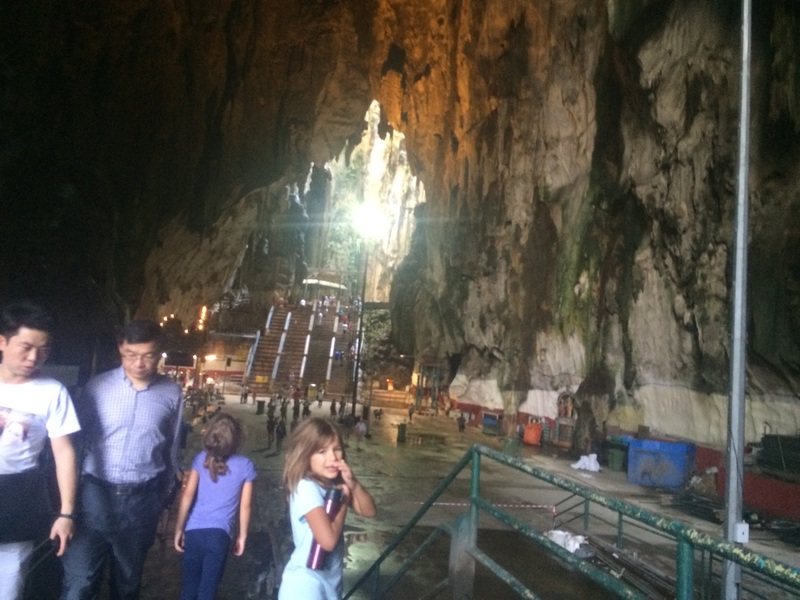 Inside the Batu Caves…no glow worms, just monkeys! The Sanctuary is supported by the government and isn’t as well funded as The David Sheldrick Wildlife Trust. 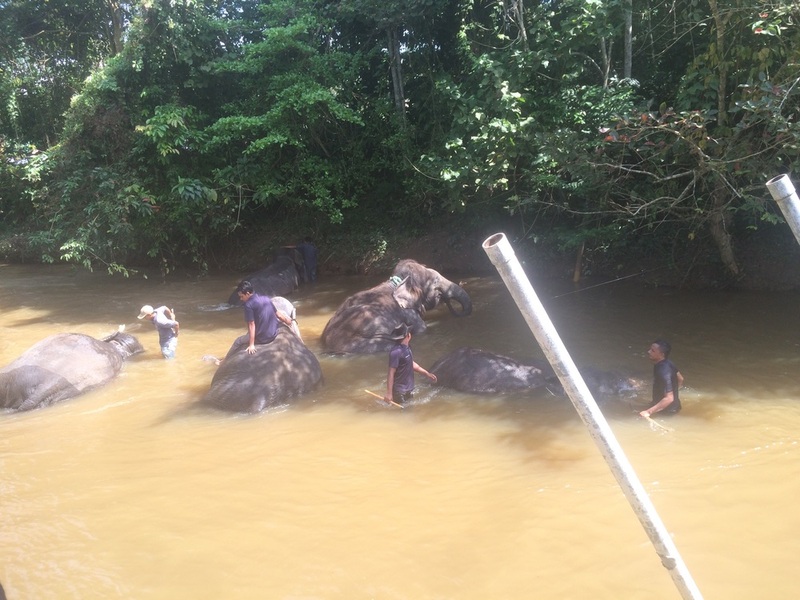 They are doing their best in trying to move elephants when there are human/elephant conflicts. The girls enjoyed feeding some elephants peanuts and watching the adults bathe in the river. The humidity was something else, so we were glad to get back into our car with A/C and head back to the city. Ahh…it feels so nice to cool off! Their trunk tickles! 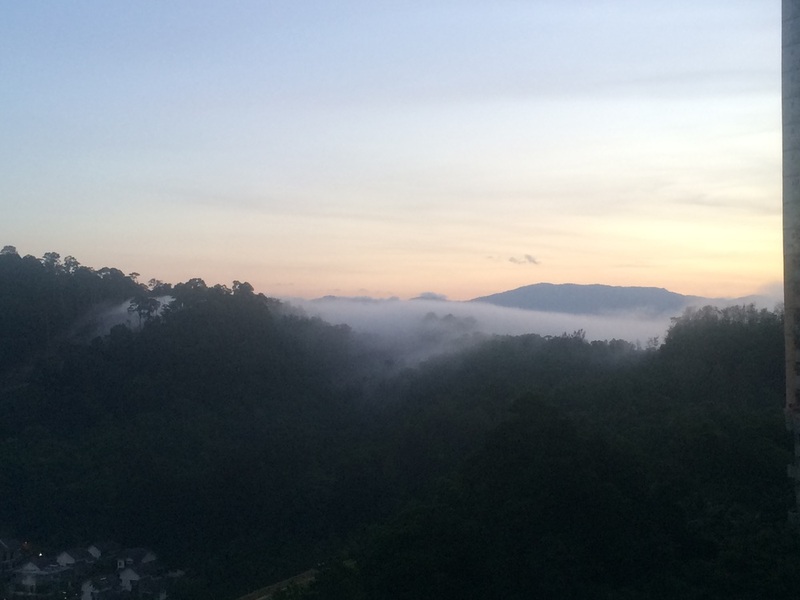 One thing that stood out for me on the drive to the sanctuary was the amount of vegetation covering Malaysia. It was such a welcome relief from the farmland that covers so much land in other countries. 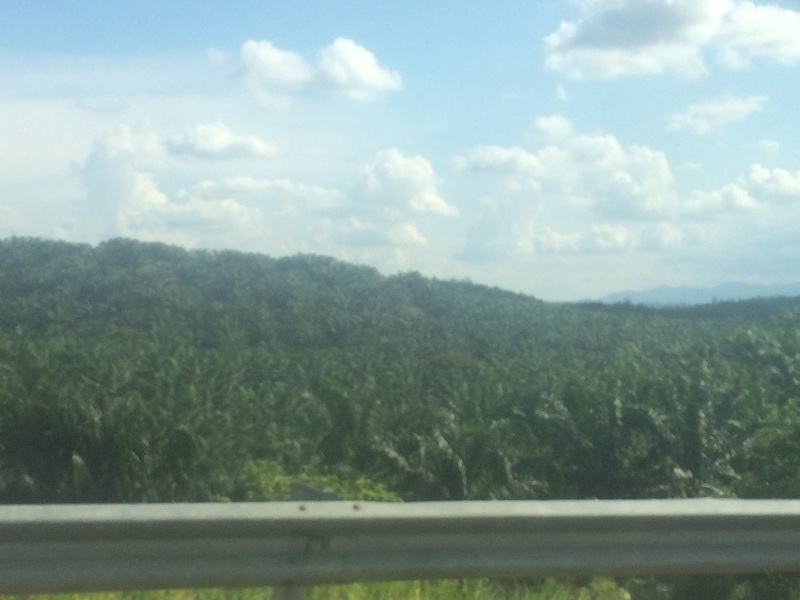 Of course, just as I thought that, we came over a hill to see miles and miles of palm oil plantations. I hadn’t seen the ones in the city yet, because we landed at nighttime. The palm oil plantations are displacing the natural habitats of the animals here including the Orang utan. Palm oil plantations for as far as the eye can see. 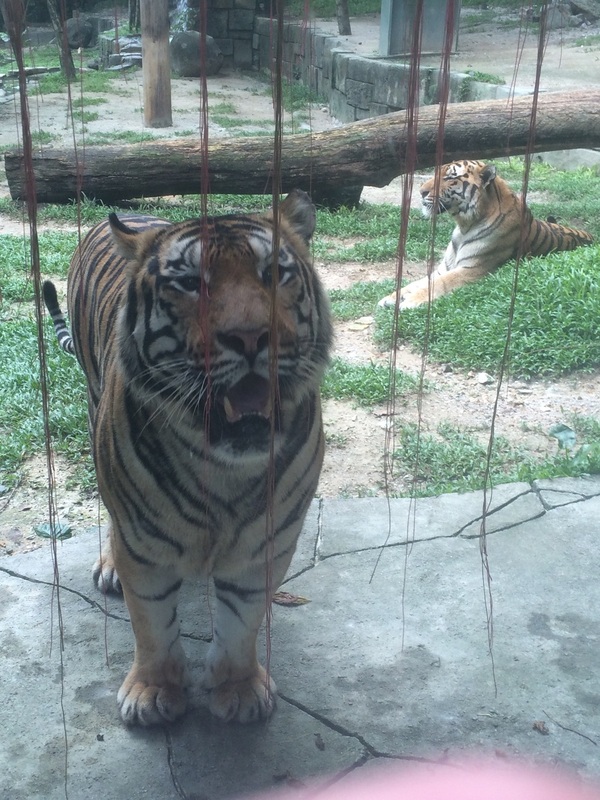 Malaysia is the country that has felt the most foreign to me so far. Maybe it’s because it’s the first Islamic country I’ve been to. It’s definitely something else hearing the call to prayers in the early hours of the morning and seeing many women in headscarves and fully dressed in a pool. The people here are friendly and we are enjoying the country and all it has to offer so far. Stay tuned for my post on Borneo. Wonderful photos of Malaysia. Will we be able to Skype or face time for Amy’s birthday. i guess that will be wednesday my time.